I love love love GLEAM by Melanie Mills! I attribute it to me getting into the Golden Globes’ Weinstein after party with no questions asked. In today’s #MMT I had plans to be outdoors, doing something near the beach with a very good looking friend 😉 I wanted to do something that would look great yet stay appropriate. Something new I think is important and different is saying the total price for the look. No one really talks about how much investment goes into making even the easiest look. It is not to brag but more so set realistic ideas of what luxury makeup costs. A lot of people expect makeup done for free or very cheap not realizing how much it costs to be a working makeup artist. I think it’s important for people wanting to be makeup artists as well, luckily a lot of products are available at pro discounts but most ultra lux products are not (i.e. ysl, trish, dior, la prarie). Start budgeting!! Every once in a while I come up with an idea that makes me wish I had my own product line. Then after googling realize I’m not the amazing genius I hoped to be as it’s been done a trillion times already. Oh well. At least my recipe for the best body scrub (seriously) ever will save you some serious $$. Yet another reason to love Organic Coconut Oil… scoop about 2-3 tablespoons and add to 10 TBSP of coffee grounds. Those measurements are totally guesses. Add only enough coconut oil to hold the coffee grounds together and form a thick paste. Think cookie dough, not cake batter. Add to a sealable container and voila you have the best body scrub you’ve ever used. I can’t say it’s the BEST face scrub because I’m partial to Exfolikate, Philosophy Microdelivery Peel and Arcona Cranberry Gommage, but it’s right up there with them. This is awesome because the grounds (you want to be using very fine grounds, especially on the face) gently slough away dead skin cells, the caffeine helps rid cellulite and wakes your skin up and the coconut oil leaves a shield of hydration. When using this the water will be very brown so be sure to use a regular body wash afterwards. I also like to use on the face as a mask for 5 minutes. For a cute idea, paint some mason jars and keep your scrub in that. Cuter than a bag of what appears to be black tar laying in your shower (awkward to explain to guests, trust me). Instantly Double Your Lashes by Adding Fibers! I was recently at Naimie’s replenishing on some items for my kit when I stumbled upon this secret weapon of a product. It’s called Fast Lash by Japonesque. Don’t get sucked into this Younique hype, any pro makeup artist is rolling their eyes at that company and companies like it. If you’re wanting longer, fuller lashes permanently I recommend a growth serum such as Latisse, Trish McEvoy Lash Enhancer or NuLash. For every once in a while this is fun for an extra boost. Be careful when applying as the brush is loaded with fibers. Since this video, I’ve been using disposable wands in the tube to put less bulk of the fibers on the lash. I am pretty good with being able to understand problems people have with makeup. I’m very blessed that I just have always seemed to get how to hold my skin to apply eyeliner, what faces to make when doing my brows.. it just comes natural. I realize about 75% of people who use makeup don’t have those built in makeup superpowers. That’s okay! You should still be able to give yourself a sultry eye without a visit to the makeup counter. Here’s how! (Quite) A while ago I got curious while at Walgreens and decided to see what new advancements Drugstore brands have come out with. That day I found a lot of things I still love, my favorite being Maybelline Color Whisper Balms (compare to Giorgio Armani Sheers lipstick or YSL Volupte Sheer Candy). 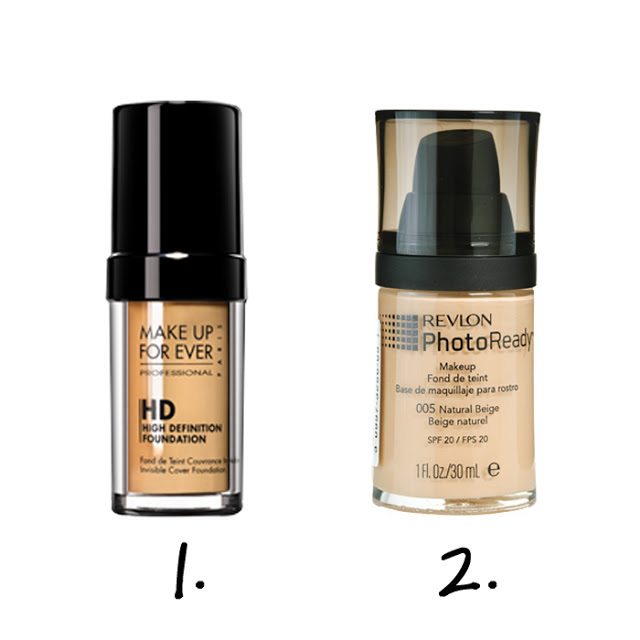 I was the most curious about Revlon HD foundation because luxury foundation, eye shadow and liquid liner is something I just can’t stray away from. I bought a bottle and brought it home, turned my studio lights and my DSLR on and got to the test. The application of both foundations feel similar and I used the same application technique on both sides of my face. At first I was extremely impressed with this foundation for being Drugstore. I liked it more than many brands I work with on the regular. It was nearly undetectable from the MUFE. But I needed to know how it photographed. I pride myself as an artist that not only can make things look outstanding on film, but natural looking in person as well, which isn’t the easiest thing to do. Behold, the results, keeping in mind that these looked almost identical to the naked eye. Lighting is the same on both sides. These photos are uploaded directly from my camera, zero altering has been done. And in lower lighting… I was also having an allergy attack so sorry for the runnyish nose, hey at least I keep it real. Both foundations had equal coverage to the eye, so if you’re looking for a nice looking foundation, I approve. However, it in no way compares to the Make Up For Ever HD which it is clearly a “knock-off” of. If you can’t tell which is which, the right side of my face (left side of the photo) is Revlon, and the left side of my face (right side of the photo) is MUFE. If you’re a makeup artist trying to build a less expensive kit in the HD foundation department, I do not approve. Womp Womp! !